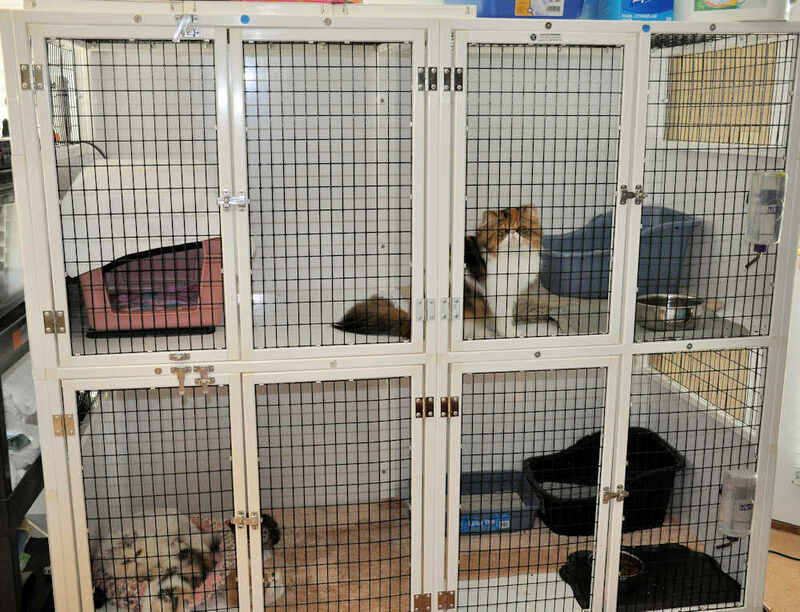 Many cat breeder websites boast about being a "cageless" or "cage-free" cattery – inferring that they allow ALL their cats to run free in their entire home. Those breeders say their kittens are "raised underfoot" in their home. An impressive statement, but is it accurate? The terms "cageless" or "cage free" are misleading, and I think, that breeder is irresponsible for the lives of the cats and kittens under their care. Nobody wants a cat living its entire life in a cage, and that is not what responsible breeders do. Responsible breeders are constantly moving cats from one enclosure to another, rearranging which cat lives with another one, and letting a few cats run the home. Intact Male Cats – if you have more than one intact (not neutered) male cat and house them together (i.e., allowing them to run the house together), eventually they will fight - that is a FACT. Protecting their territory and the female cats that they consider "theirs" is a male cat's natural instinct. Male cat fights are violent, resulting in severe injury or death. If one owns more than one intact male, they must live (at least part of the time) in a safe enclosure. Also, some intact male cats spray and or mark their territory (which is the breeder's HOME). With intact male cats running loose in the home with adult female cats, how can a breeder know who is the father of the kittens? Female cats can breed with more than one male cat resulting in a litter with multiple sires. In order to determine parentage, a buccal swab from each kitten in the litter needs to be taken, a buccal swab of all the possible candidates for father, and those swabs are then submitted to University of California Davis (UC Davis) for paternity testing; a costly $40 an animal. That adds up fast! Then there is the added cost of registering the kittens with multiple sires with the Cat Fanciers' Association (CFA). With intact male cats running loose in the home, how can a breeder determine when the due date for the kittens is? Responsible breeders will put the female that they want bred into an enclosure with the stud cat they want to use. That way they know: (1) the date of breeding, and (2) the estimated due date for the kittens. Another reason for using enclosures for an intact male cat is because they can re-breed a female cat that comes into heat shortly after she has had her kittens (as early as eight weeks after giving birth to the previous litter)!!! Young kittens have immature immune systems and can become sick just by being around other cats. It is no fun trying to give antibiotics to a litter of kittens that weigh only a few ounces, and it is expensive to treat entire litters. Intact male cats can be loving with kittens. However, their behavior is unpredictable. A male may suddenly decide to try to breed a nine-week-old kitten! A male cat can pounce on the kitten, grab it by its neck and try to breed it; this behavior can result in an injury such as a broken spine for the kitten or even its death. A severe injury would mean euthanizing a kitten. An intact male may try to breed an older kitten (any kitten under 1-year of age). Responsible breeders will not breed a female cat before it is at least one year of age as they are not emotionally mature enough to birth and nurture a litter of kittens. A litter of kittens born to a young mother could need either bottle or tube feeding every two hours. Health issues – Intact males can develop bladder issues. Inspecting the male cat's litter box daily to see if that male is urinating and how much is a must. When cats live together as a group, there is no way to tell which cat is going in which litter box or how much each cat is urinating. This can be risky in male cats. It is best to house a male cat separately from other cats. Male cats normally urinate at least once a day, and it is a fairly large amount. Female cats – – Intact females are also territorial, especially when they are in heat. An intact, cycling female may "mark" their territory which is your furniture, the carpets, etc. I do not want to sit on a couch that smells like hormonal cat urine. Also, an in heat female may fight with other female cats in the house that may also be in heat. Cats like to jump. Cats gain the most weight the last two weeks of pregnancy, and they may not be as steady when trying to climb or jump. Therefore, a cat is at risk for either injury or miscarrying the kittens if she were to fall from jumping or climbing. When ready to give birth, a female cat will often seek out a secluded place to hide and protect the kittens. If the female is running loose in the house, it may be difficult to find the kittens, not to mention the mess from the birthing. Cats can become nervous and decide to start moving kittens around to a "better" hiding place (under furniture, in closets, etc.) for cats that run the whole house. Moving kittens could result in leaving one behind or injury. Litter box – Kittens in a confined area with their mother, will learn good litter box habits. Kittens that run the entire house (or even a spare room) will learn that they can go to the bathroom anywhere they happen to find themselves at the time, not just the litter box. A spare room or the entire home presents too many choices to a very young kitten. Litter box training takes time for kittens to learn. Illness – All cats get sick at some point. Using enclosures lessens the risk that one cat can transfer sickness to the entire household of cats which can be cost prohibitive to treat. Isolating a sick cat from other cats allows for observation of food intake, litter box use, etc. New Cat - When bringing in a new cat to a home with existing cat(s) it is advisable to quarantine the new cat for at least 10-12 days (preferably three to four full weeks). Many illnesses will incubate during this period. If the new cat becomes sick (upper respiratory infection, ringworm, etc.) during isolation, the other cats in the household will also become sick. Treating just one cat because it was quarantined, is easier and less expensive than treating an entire household of cats! Enclosures come in all shapes, sizes and materials. Before buying an enclosure consider the following: the material it is made from, cleaning ease, how it will stand up to disinfecting (i.e., most breeders use a bleach solution), floor space, shelves, and wire spacing / material. Space - A cat needs more horizontal space than vertical space, so an enclosure should be at least 4 or 5 feet wide (length). Material and Cleanability - Made from a non-porous material. No place where food and other detritus can fall and become trapped. Made from materials that can withstand multiple cleanings and bear exposure to bleach or similar disinfecting solutions. Wire - A well-made enclosure will not have solid wall panels so the cats have access to fresh air, light and can see other cats. Therefore, most enclosures have wire on them (not the floor they walk on!!). I think, vinyl coated wire is the safest for cats, and it is washable, easy to disinfect and will not rust. Wire spacing should be small enough that a kitten cannot fall through or get stuck in. Shelves - Cats like to jump and perch, so a shelf in the enclosure is a must. Non-porous material to withstand rigorous cleanings and disinfectings. Throughout the years, we have experienced some of the issues mentioned above. When we first started breeding and raising Persian cats, we let all the cats run the house. We did not have a male cat, so we didn't have to worry about marking or a surprise mating. However, we quickly learned that when keeping multiple intact female cats that when they came into season, they would fight with each other, and a few of them started spraying and/or marking to claim "their" territory in the home. This behavior damaged our carpets, our furniture, and our window coverings. Yuck! After realizing that intact female cats do in fact mark and spray, we converted a spare bedroom into the "cat room" with enclosures. Cats that were in season were housed in enclosures in the cat room. Non-cycling cats were free to run the entire house (again, we did not have a male yet). This plan worked for a few years until we got our first intact male Persian cat which complicated things a bit. With an intact male cat, we could not allow him to run with all the female cats or we would not know: (1) who he had bred, or (2) when kittens were due. When a cat was due to have kittens, she would give birth in our bedroom. When the kittens were old enough to crawl out of the kennel carrier, we would move mother and kittens into the "cat room" for room to stretch their legs, play, and develop good litter box habits. However, it quickly became obvious that we were running into litter box issues. Since the kittens were running the cat room, they were using the carpet for litter boxes. It was obvious we needed to use enclosures for birthing cats and until they were old enough to "get" what the litter box was for. We needed to find a safe way of containing the cats and kittens during different times of the year and for different reasons: breeding, pregnancy, illness, male cats, kittens, litter box training, a new cat, etc. We started talking with other breeders, looking at other breeders' websites and what they had to say (if anything) about the enclosures they were using, and researching the Internet; we came across CD&E Enterprises. CD&E make enclosures of all sizes, shapes, and for all different animals. We currently have five CD&E enclosures, are thoroughly satisfied with them and would not use any other enclosure for our precious Persian cats. PVC coated wire (not powder coated!) ~ so durable it's used for lobster traps! Spring-loaded safety latches ~ easy-open for you, but escape-proof for the cat! CD&E provided the descriptive text and is used with permission of CD&E Enterprises - (800) 528-2243. All rights reserved.